We are in our homes this morning praising God going before us on our journey to East Africa! Our mission included training 100 children’s workers and pastors. We loved sharing the importance of teaching God’s Word to children. The participants welcomed our message enthusiastically and said that we “set the fire”. We pray by the power of the Holy Spirit that the fire will spread throughout all Malawi and beyond. There was sheer joy as we were greeted by 300 children in the village founded by Hope Missions Ministries. We sang, marched, and shared the gospel where 40 children prayed to receive Christ. Our team will never forget the joy of vibrant worship in the churches on Sunday. It was our privilege to teach in the classes for the children. That afternoon brought 100 kids to a funfest where again we loved singing, marching and sharing the gospel. When given the scratch off cross, the children simultaneously expressed, “Ahhhhhh” as they scratched off their sins to reveal the beautiful life in Christ underneath. We have had some exciting days in Gaborone, Botswana. We loved singing, sharing the gospel, and demonstrating an Orff ensemble with 600 enthusiastic and rhythmically talented teens. Sixty pastors and church leaders gathered for a conference of which we were a part. The conference opened with inspirational words from the leaders about the importance of teaching the children: “If we do not teach them strong Christian principles, the world will. We could lose this generation.” Our presentation and demonstration of curriculum for babies to three year olds was very well received. There were 60 workers in attendance who were very attentive, participatory, and receptive. They took notes, made good comments, and asked good questions. They left with a better understanding of the why and how of children’s ministry. We praise God for their receptiveness and ask God to bless them in their service. Sunday took us to several churches where we were privileged to work with the children and attend church services. We are always blessed by the passionate worship! The message was delivered by Lucy, our mission partner from Kenya, who has been traveling with us. She exhorted the congregation to “train up a child in the way he should go.” It was a passionate message. One of the highlights of the day was hosting a funfest for 240 children and parents. Once again we sang, marched, and clapped. Most importantly, the gospel was shared! Several children indicated that they prayed to receive Christ for the first time. Hallelujah! Our work here is done, and we thank the Lord and JFBC for this opportunity! We pray that He will multiply our efforts and continue to grow those seeds we have planted. We give Him all the glory! God is Moving in Japan! God is moving! We started taking mission trips to Kamaishi, Japan in 2011 (6 months after the tsunami hit the region); this was our eighth mission trip to the area. We spent most of our first trip removing rocks and debris in rice fields to prepare the ground for harvest (Isaiah 62:10). 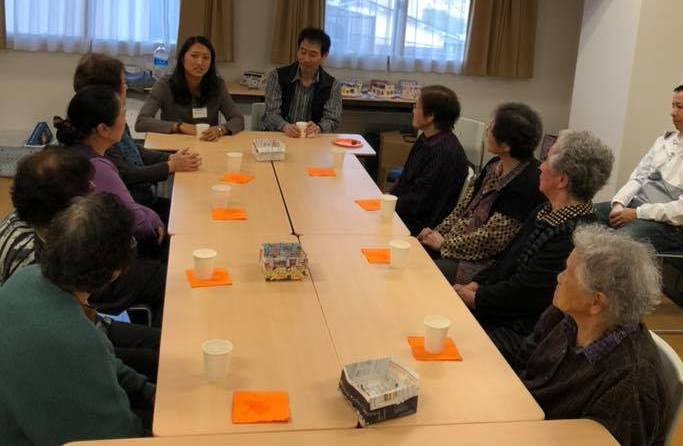 Over the next few years, we emphasized community outreach by serving coffee and snacks and listening the tragic stories that tsunami survivors shared with us. We were then able to share our testimonies, make crafts that pointed to our hope, and explain the reason why we were there to serve them through Christ’s love for us. One of our team members from that first trip in 2011 fell in love with Japan and its people and asked his company to send him to Tokyo through business. God answered his prayer, and he was able to move to Tokyo 3 years ago with his company to continue outreach through business as mission. He has joined us the past two years on our return trips to Kamaishi. This year we could share both our testimonies and present the gospel message by using the Chemical cross illustration. It is a step-by-step process to engage people to share the good news of Christ. God is certainly moving to reveal himself to people in Kamaishi. Keishi uses the chemical cross as an illustration to present the Gospel. As I reflect on our mission trip, I definitely felt God's presence in tangible ways. The “hard soil” and the spiritual darkness in Japan can easily discourage, but I believe God was constantly encouraging our team by revealing his glory through nature (Psalm 19:1). Throughout the trip, our team witnessed beautiful sunrises, rainbows, fall leaf colors, mountains, and scenic water views at Kamaishi and Otsuchi Bay. It was like God was testifying alongside each of us! I echo what Jerry wrote and especially felt God’s abiding presence on Tuesday (October 30th) the last day of serving in Tohoku. That morning, one of our members posted a picture of a rainbow visible from her hotel room in our team message group thread. Another member shared a devotional link on faith with a beautiful rainbow pictured in between mountains that literally looked like the rainbow we kept seeing on our way to the first event that morning! Once we arrived, the room we were to set up had a beautiful rainbow origami craft featured on the wall….and if that wasn’t enough, we were able to share about the Biblical meaning of the rainbow with the participants, who also noticed the amazing rainbow that morning. These ladies display their newly made recipe boxes (with the origami rainbow on the wall behind us). Later that same day, we were able to meet with a woman business owner who we met on the train five years earlier. Every year since that first meeting, God has provided us with the opportunity to build our relationship with her. This year our team member Wenwen, also a business owner, shared her testimony of coming to faith and explained how reading God’s Word for herself opened her eyes to the truth. By the end of our time together, our friend was willing to receive a Bible and begin reading it for herself! We had numerous opportunities in various settings to share our testimonies. For me, the most amazing thing on this trip was how God used not only what I prepared to speak to one woman in particular (Mrs. Y), but also everything His Spirit guided me to share. Mrs. Y really seemed to connect with my mom’s story, which I had not even planned to share. I also explained how through prayer I began to understand how much God loves and treasures each of us—His creations. This realization allowed me to set aside my discrimination and apprehension about coming to Japan. God always knows exactly what we need to hear and what we need to overcome. Also, even though our Halloween night street evangelism effort wasn't exactly what we had hoped for, I recognized God’s presence and was encouraged. I don't think it was a pure coincidence that the first kids we spoke to were students with architecture majors! (I have a graduate degree in architecture!) Even though we didn't distribute as many tracts as we hoped, God sees our hearts and surely was with us every step of the way. He can use each of those eight encounters and distributed tracts as seeds for His glory! Sharing our testimonies with the homeless who are ministered to by the Sidewalk Chapel ministry. I thought a lot about my testimony leading up to the Yoyogi Park sidewalk ministry on Saturday morning. My perfectionism was causing me stress because I was relying on my own wisdom to try to refine every word of my testimony script. I was especially concerned about the content and duration. I finally decided just to allow the Holy Spirit to speak through me and to stop overthinking my testimony. After I decided to do that, the stress left me immediately and I was at peace. It was a good reminder that we just have to be obedient and willing; God assumes the responsibility to convert hearts. Keishi and Andrea: the next Iron Chefs! We witnessed God’s provision in so many of the details on the trip! For example, despite the fact that we forgot to bring the mayonnaise to make the chicken salad for one of our events, with the help of our ministry partner, we ended up with all the necessary ingredients and had the perfect amount for the crowd in attendance. We were amazed by his goodness and attention to even the details of the food we planned to serve. We shared our sign language song with numerous groups. Another blessing in the details of the trip was the fact that we taught our team a Japanese song using sign language to share at events and activities along the way. It turned out to be well received, fun, and joyful! We shared the song at a weekly homeless Bible Study in Tokyo and discovered that there was a deaf believer in attendance. It was so wonderful to be able to praise the LORD with him and connect through that song we had prepared! We truly felt the Lord our God had gone before us and established our steps! To Him be the glory! At Sidewalk ministry: presenting the Gospel. While our team shared numerous treasured experiences while serving with e3 Partners in Tanzania, I would like to share just two. Both show the steadfastness of the Lord, and through both experiences our team learned valuable lessons about Him and grew in our relationships with Him. We were under trees, in a village school yard, an hour from the nearest town, deep in the heart of Tanzania, sharing Bible stories. Our team presented a skit on David and Goliath to about 40 men and women. A few were churched Christians, but most were unreached people of the Zamaro people group, many of whom are Muslims. Naturally we cast the tallest lady on our team as Goliath and the shortest as David. The rest of us played Children of Abraham, Philistines, and King Saul. The reception of our “performance” caught us so off guard that we could hardly keep from splitting our sides with laughter! Crowds gathered, curious children crept in from the dirt road, translators were recording on their phones, and laughter erupted along with loud clapping and shouting; they loved it! Our audience screamed for our Goliath, who roared, flexed her arms and wore a costume made from aluminum foil and poster paper! David shot ping pong balls at Goliath with a sling shot, and the king wore her paper crown proudly. Our scribe and her interpreter narrated the story from a “scroll” on a paper towel roller, and the rest of us shouted our lines, giggled, and basically acted crazy. The next day when we arrived at the ministry site, everyone cheered and flexed their arms when our Goliath walked up! What did we learn? We didn’t need expensive costumes to get the story across. God told His story through us; we just went where God sent us and acted on the stage He provided, for the audience He prepared ahead of time. A small group plans the pictures they will draw from the story of Nehemiah. 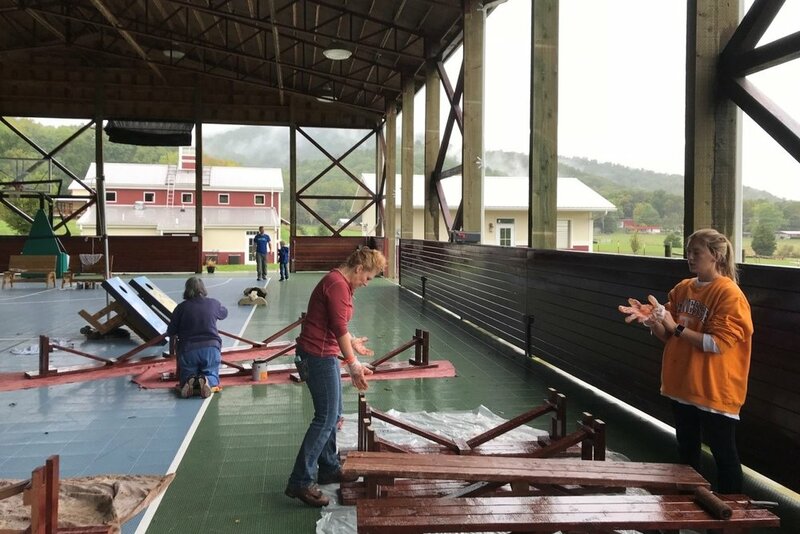 The second experience I want to share with you happened on the second day at our ministry site. Our team had been divided into teaching teams of 2, and the class had been divided into small groups of 7-10. Each small group included at least one Christian national, and Muslims comprised the rest of the group. On that day we were teaching Creation, Fall, and Redemption. 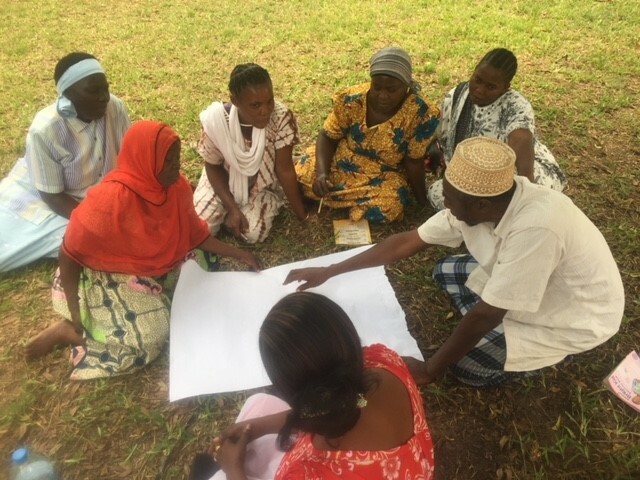 While I certainly wanted to finish strong and present the full Gospel, I didn’t want my manner of presentation to deter the Muslims (and one Muslim man in particular) in our group from returning to finish the week of Community Transformation classes. I wanted to speak with love, gentleness, and respect, and as I spoke, I prayed in my mind and heart, “not too strong not too soft.” My partner spoke of Creation, I spoke of the Fall, and as I began Redemption the one Christian lady in our small group interrupted me and said, “My name is Amelia. I, myself, choose to follow Jesus. He is the Son of God and came to die on the cross for our sins.” All I could say was, “Thank you Lord.” I truly believe that God placed Amelia in our group to share the Gospel in a way that this Muslim man could really hear. As a member of his community and culture, Amelia has a kind of credibility and influence that we did not, and she remains a point of contact should he have questions. Later, I encouraged Amelia and thanked her for sharing her testimony in our small group. Sharing with one of the small groups. This experiences really brought home the power of prayer. Prayers whispered in the moment as well as before you arrive are truly heard by our God. Here, we are learning how to make batik—a fabric dying technique. Hello from Albania! 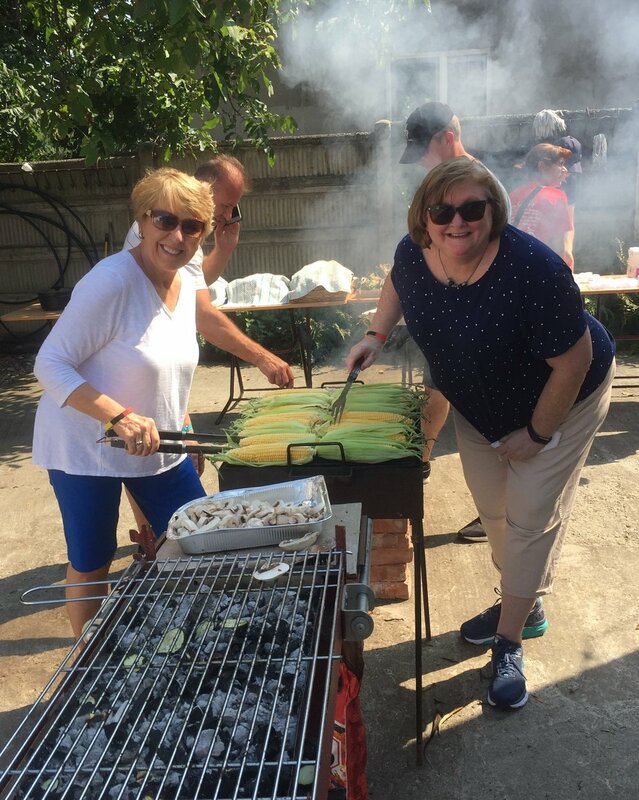 Team America has been at English Camp on the beaches of Vlore since Monday, and we all agree that it is a privilege to serve alongside the Cru team in this outreach ministry to college students. I just escaped Albania Night for a few minutes so I can tell you what is happening on this side of the world. We have four classes of fairly proficient English speakers from the University in Tirana, so several of us have had to increase the level of our lessons significantly. Beyond teaching article adjectives, contractions, and conjunctions, we are playing lots of games and having deep discussions about God. On Monday we had the students fill out a form which identifies their worldview. On Tuesday we read through Genesis 1 in order to discuss creation based on our worldview and theirs. Today we went over to Genesis 3 where they learned about sin and separation from God from a Biblical perspective. This led to many thoughtful questions, which we continued in the afternoon by taking individual students to “coffee” (a generic term describing a time of socializing with friends). We, of course, do this in order to know the students on a more personal level with the hope of sharing the Gospel and them making a decision to follow Jesus. On Tuesday night, we hosted America Night. We attempted to explain the great diversity that exists in our country through a skit, team games, dancing, and a few boring statistics (Darin’s words…not mine). The kids ate brownies and ice cream, enjoyed our photo booth, and went away with their very own American T-shirt. The one thing that surprised us all is that none of them had every played BINGO. They are a very competitive group, so you can imagine how serious they took this game! Blessings and love from all of us!